There is lots of Christmas cheer to be found in these wonderfully festive picture books! A homemade together Christmas / Maryann Cocca-Leffler. The nutcracker’s Night before Christmas / written by Keith Brockett ; illustrated by Joseph Cowman. Santa’s reindeer / Tom Duxbury, Matilda Tristram ; illustrated by Nick Sharratt. Reindeer has lost his squeaky nose, help him find it, meeting lots of animals and squeaking all the way! Me and my dragon : Christmas spirit / David Biedrzycki. Santa’s tight squeeze / Alex Field ; illustrated by Karen Erasmus. Samurai Santa : a very ninja Christmas / by Rubin Pingk. The knights before Christmas / Joan Holub ; illustrated by Scott Magoon. Share some magic with these age old stories and some with a twist. The fairytale hairdresser and the sugar plum fairy / Abie Longstaff & Lauren Beard. Help / Sally Grindley ; and Peter Utton. Hansel & Gretel / Holly Hobbie. Peter and the wolf / adapted and illustrated by Ayesha L. Rubio. Sleeping Beauty / Sarah Gibb. Jack Frost / by William Joyce ; illustrated by William Joyce and Andrew Theophilopoulos. Go wild with these great books, they might tame even the wildest child. Wild child / written and illustrated by Steven Salerno. Lion practice / Emma Carlisle. Wild feelings / David Milgrim. Lovely old lion / Julia Jarman, Susan Varley. Mitford at the fashion zoo / by Donald Robertson. Books to share with Dad! Father’s Day is coming up this Sunday, so here’s a great selection of new books for dads to share. Daddy hugs / Nancy Tafuri. Daddy cuddle / written by Kate Mayes ; illustrated by Sara Acton. My dad still thinks he’s funny / by Katrina Germein ; illustrated by Tom Jellett. Daddies are great! / Meredith Costain ; Polona Lovšin. My dad is a giraffe / Stephen Michael King. Daddy, you’re awesome / Laine Mitchell ; illustrated by Renée Treml. Dragons, robots, dinosaurs and monsters. There is a creature here for everyone to love. Have you seen my monster? / Steve Light. Ace Dragon Ltd. / Russell Hoban & Quentin Blake. Power down, Little Robot / Anna Staniszewski ; illustrated by Tim Zeltner. A monster moved in! / by Timothy Knapman ; illustrated by Loretta Schauer. Space dog / Mini Grey. Dinosaur police / by Sarah McIntyre. Have you seen a monster? / Raymond McGrath. In a bad mood? Feeling grumpy? Enjoy these new picture books all about moods, manners and cheering up. Prickly Jenny / Sibylle Delacroix. 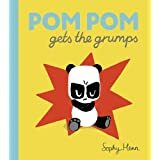 Pom Pom Panda gets the grumps / by Sophy Henn. Big, bad owl / written by Steve Smallman ; illustrated by Richard Watson. Abracazebra / story by Helen Docherty ; illustrated by Thomas Docherty. Please Mr Panda / Steve Antony. These delightful new books will charm and bring a smile to everyone’s face. Bums & tums : a lift-the-flap book of animals / illustrated by Mandy Foot. Frida and Bear / Anthony Browne, Hanne Bartholin. I ain’t gonna paint no more! / Karen Beaumont ; illustrated by David Catrow. Get out of my bath! / Britta Teckentrup. The pirate’s bed / Nicola Winstanley ; illustrated by Matt James. Rustle up a rhythm / written by Rosalind Malam ; illustrated by Sarah Nelisiwe Anderson. Janine / by Maryann Cocca-Leffler. I had a favorite hat / by Boni Ashburn ; pictures by Robyn Ng. Mums are especially important this weekend so share a story with her this Sunday. Some mums / Nick Bland. Mum’s the word / [written by] Timothy Knapman and [illustrated by] Jamie Littler. Cuddles for Mummy / Ruby Brown ; illustrated by Tina Macnaughton. I love my granny / Giles Andreae & Emma Dodd. Use your words, Sophie! / Rosemary Wells. Mission: new baby : top secret info for big brothers & sisters / written by Susan Hood ; illustrated by Mary Lundquist. Buses, diggers, boats, trucks and bikes. Take a ride with your child and these fantastic books. You can’t take an elephant on the bus / Patricia Cleveland-Peck ; illustrated by David Tazzyman. Follow that car / Lucy Feather ; [illustrations by] Stephen Lomp. A river / by Marc Martin. Digger dog / illustrated by Cecilia Johansson ; written by William Bee. Monster trucks. Mega city cup / Jon Hinton ; illustrated by Tado. The Usborne big book of big trucks / written by Megan Cullis ; illustrated by Mike Byrne. Ride, Riccardo, ride! / written by Phil Cummings ; illustrated by Shane Devries. “Ricardo loved to ride his bike through the village. He rode under endless skies, quiet and clear. He rode every day…But then the shadows came.”–Back cover. Reading these stories to your kids will make everyone’s day better! How to / Julie Morstad. Unicorn thinks he’s pretty great / Bob Shea. Let’s go, Hugo! / Angela Dominguez. Rabbit and the Not-So-Big-Bad Wolf / by Michaël Escoffier ; illustrated by Kris Di Giacomo. Puss Jekyll, Cat Hyde / Joyce Dunbar ; illustrated by Jill Barton.